This small crowned Buddha is cast in an alloy with a very high copper content, which has made the surface quite soft, resulting in much wear to the facial features, the raised beading of the jewellery, and to the ornamentation. Also the surface has small marks, almost as if it had been near a fire. Previously it was identified as Akshobya, Buddha of the Eastern Paradise, from the use of the bhumisparsha mudra and what may have been a vajra laid in front of his feet, though the object is now very worn and resembles the gathered pleats of a monastic robe. Indian iconographic treatises describe Akshobhya as having his left hand in the lap, palm upwards; here, some now lost attribute was placed in the palm of the left hand, its former presence indicated by a hole into which it was inserted . Possibly this Buddha is a representation of Sakyamuni as celestial sovereign, in which case he would formerly have held an alms bowl in the left hand . Or, if he held a vajra in the palm of his hand, the identification as Akshobhya would indeed be confirmed. A late Pala sculpture of a crowned Akshobhya (h. 22.7 cm), now preserved in the Potala Palace at Lhasa has precisely the same crown and garments as this much smaller sculpture in the Ashmolean . The tip of the left kneecap has also broken at an undetermined time. The Buddha wears a high crown composed of three very elongated isosceles triangles and a plain band over the forehead. The crown has two florets at the level of the temples, from which lappets of fabric extend to the shoulders. Similar crowns with lateral florets and flat shoulder-length ribbons are found in certain Tibetan sculptures of the tenth to eleventh century, which Weldon and Casey Singer have attributed to a Newar workshop in Tibet . 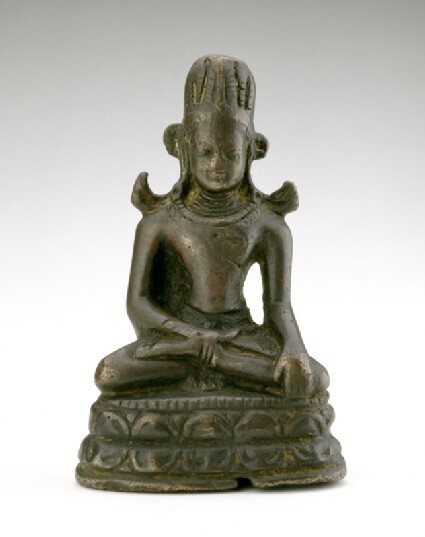 Despite certain Newar influences of the late Licchavi period in this small Buddha, such as his slender body proportions, the very close fitting dhoti and upper blouse, and the gilt copper alloy, the high triangular panels of his crown and the manner of the necklaces are very similar to a group of late Pala sculptures of the Tathagata Buddha now preserved in Tibet . The beaded edge of the upper lotus pedestal and the wide aligned petals also reflect the influence of late Pala India . The very long striated ribbons which rise from the shoulders reflect Kashmiri prototypes of the late tenth to early eleventh century, made in Kashmir or in west Tibet, to which Kashmiri artists were invited by the royalty of the Guge kingdom . A higher, exaggerated and more stylized curve of the ribbons is later common in western Tibetan sculptures reflecting vestigial influences of the Kashmir aesthetic (cat. no. 44). The Buddha glances downward, his chin slightly receding, and his facial shape is squarer, closer to the Newar rather than Kashmir aesthetic. The chest has one short round necklace at the level of collarbone, beside which there is incised carving of diagonal lines which cross just above the heart. There is a very small hole at the point of juncture, as if a jewel now lost had been inset. The waist is thin, with a pronounced fold of flesh just above the belt of the dhoti which clings to the body save for the splay of pleats beneath the crossed ankles. The proportions of the slender arms, legs, feet, and hands are harmonious. The back is unfinished. The silhouette of the base is indicated, but without the aligned petals seen at the front, or the beaded edge of the throne cushion. It is well known that around 1000 ad the sovereigns of the west Tibetan kingdom of Guge invited many artists from Kashmir to decorate the newly founded temples of their capital in Toling. Recent scholarship has shown that artists from India and Nepal were also invited to collaborate in the embellishment of the temples of the capital . The degree to which this sculpture reflects a balanced blend of Indian, Newar, and Kashmiri aesthetic influences suggests that it may well be a product of this milieu. In addition, the unfinished treatment of the back of the sculpture has been noted in large sculptures attributed to the artistic production of the kingdom of western Tibet in this period . It is fitting therefore to find this characteristic as well in this sculpture. Its size and weight render it eminently portable. A sculpture such as this small Buddha may have lost its gilding due to travel in the pocket of an itinerant Buddhist teacher. 1 de Mallmann, Introduction a l'iconographie du tantrisme bouddhique, p. 92. 2 von Schroeder, Buddhist Sculptures in Tibet, pl. 305A. 3 As will be discussed below, this Buddha was probably cast in Tibet at a time when there was much translation of liturgies and creation of new iconographic forms, some of which were not included in later liturgical anthologies. The iconography of this Buddha may reflect a transitional phase of development in this period. 4 See Pal, Himalayas: An Aesthetic Adventure, pl. 113, for the Vajrahumkara sculpture from the Nyingjei Lam collection, and Weldon and Casey Singer, The Sculptural Heritage of Tibet, pl. 10, for a more detailed discussion of this sculpture. 5 von Schroeder, op. cit., vol. 1, pl. 80A, for an inscribed Akshobhya in precisely this iconography, wearing a five-pointed crown, with the upper garment draped identically. The Potala sculpture has a lotus over the shoulder, which is not present in the Ashmolean Buddha. 6 E.g. ibid., pls. 84A-B. 7 See the eleventh century Avalokitesvara in the Nitta collection, published by Pal, The Art and Architecture of Ancient Kashmir, p. 121, for ribbons and crown very similar to this sculpture. See also Introduction above, for discussion of sculptures made in Tibet by Kashmiri artists, notably in Khar tse, near Toling. 8 See Introduction, based on the research of R. Vitali, The Kingdom of Gu.ge Pu.hrang, p. 313, for Indian artists from Magadha working in Toling, and ibid., pp. 263 et seq., for Newar artists collaborating with those from Kashmir to create the sculptures of Khojarnath in 996. 9 See Reedy, Himalayan Sculpture, pl. W125-6, for discussion of this treatment of the back as frequently occurring in Western Tibetan sculpture. See also Heller, Tibetan Art, pl. 34, for the 100 cm. Padmapani sculpture in the Pritzker collection, unfinished in the back, also attributed to early eleventh-century western Tibet.